Alright, lets talk about these past 8 days. Things are happening! Definitely getting more comfortable with cold e-mails and elevator pitches – and I’m feeling pretty good about where things are going. Slightly overwhelmed, but also thrilled to meet some of these people and hear their stories. I have a lot of questions to construct and send as well as do more research on specific job positions. I contacted someone who has leased land and has agreed to be interviewed and share his family’s experience with fracking on their property. This is happening the first week of Feb. It wont fit in the deadline I gave myself, but it’s definitely a start. I have another interview set up with someone who utilizes renewable energy. This interview date will also exceed my deadline. Yeah know, what I’ve realized is that if I talk to anyone about fracking, most have some type of connection to it or know of someone. This is interesting, because you just never know what ties everyone has and it’s actually not surprising that at least someone knows something or someone associated with hydrofracking. This weekend I actually met someone from Denmark who has family members who are fracking activists. I plan on contacting her father soon and hopefully hear his perspective on whats happening in his town in Europe. I’m really excited about this! The challenge here is he doesn’t speak very good English, so I’m relying on google translate.. I’ve never used this before so we’ll see what happens! Moving on to my thesis paper…Ugh. This guy has been neglected. So lets see if I cant actually meet my deadline with this. (This is something I might start doing for every post. Personally, I’m always curious as to what people are listening to while they type any piece of writing. There are several times too where I just want to ask people with headphones in, “Hey whatcha listening to?” just out of curiosity.) – Becca fun fact. That means I have negative 4 months until my thesis show but actually I have 3 1/2 months to get all my interviews, photos, and finished paper. Yikes. I often get in this routine of, “Oh, I’ll do it tomorrow.” Tomorrow comes. “Oh, it’s (insert something ridiculous) i’ll do it tomorrow” and so on. It’s a terrible thing to get into, but what i’ve realized is that the time is right NOW. There is no better time to reach out, write it down, or make something. Create something, even if it’s terrible at least you’re doing something. I find making terrible work to be more encouraging than discouraging. Because you’re always learning something! Make it a point to learn at least SOMETHING. My dad is a carpenter/painter/plasterer/badass. He built the house i’m sitting in as I type this. Unreal right! He’s one of the most talented people I know. The craftsman’s craftsman. So about a week ago I asked him if he would help me make a picture frame. Sounds pretty simple right? I had thought about making my own frames for my thesis show and this would be my first taste of what that would feel/look like to construct my own frames. The first frame we made I did about 40% of it. It turned out great though! The second one, I thought “Ok, i’m gonna try and do this on my own now. Here we go.” Well, even after WoodShop 101- the table saw was STILL TERRIFYING. And when you get as close as 1.5 inch boarders, you’re only a breath away from cutting off fingers. So. my dad had to intervene. After we got the pieces cut for the boarders, then came time for the angles. Which is the toughest part about framing. Last time we used an electric saw to cut the angles, which still took a couple hours. It was a lot of placing the pieces on the table, and trying to figure out how to get rid of the gaps between pieces so it was a lot of improv cutting getting the angles even. But it turned out great in the end. SO. 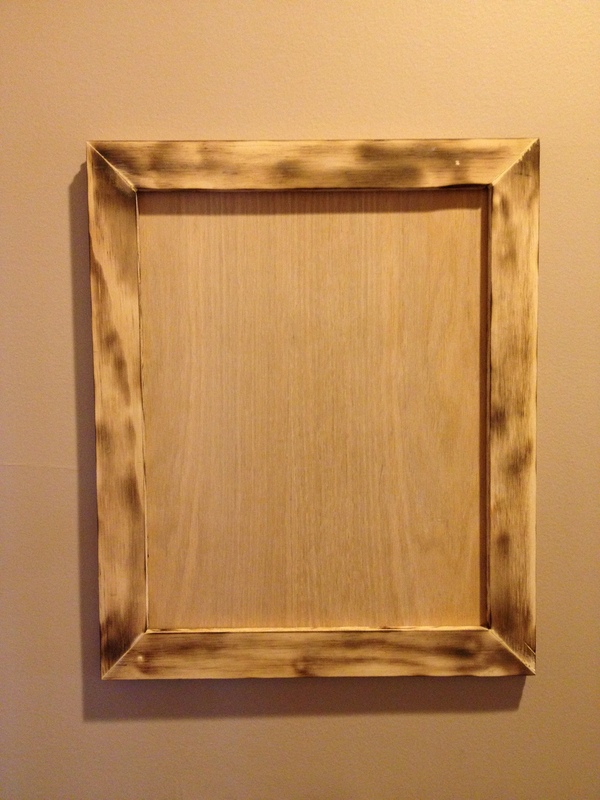 The frame we made last night, I decided, “hey wouldn’t it be more accurate if we hand sawed the angles?” Let me tell you, I had no idea how difficult it was to saw wood! Not to sound pathetic, but it definitely gave me a new perspective on woodcraft and I gained a compassion for the folks that didn’t have table saws, and electric saws back in the day when everything was made from hand. I cant image building a house by hand! It was a fun experience though. My great-grandpa would of probably laughed at me about my sawing skills. I was in kindergarten when I would go over to his workshop with my brother, who would’ve been in 2nd grade. His workshop always smelled like cigars and fresh cut wood. A smell you never forget. He would use the empty cigar boxes to house nails or bolts of all sizes and they’d be lined up on the shelf, from what I can remember. I remember my brother was really into pine car derby racing when he was in the boy scouts, so my great-grandpa helped him build one. He was always working on something. The lesson I learned was that woodcraft is not as easy as it may seem, and much like any craft, you’re gonna make work that can be very disappointing and probably not like you envisioned it to be. But as I said early on, i’m more encouraged now to try it again rather than give up. So with my thesis? I’m giving myself a deadline. Feb. 1st (14 days) to have at least 2 more pages written of my thesis and 2-3 interviews. I’ve created this blog to begin documenting my thoughts and experiences as I work on my senior thesis project I titled Fission Country. It’s a project centered around the topic of Hydraulic Fracturing. A topic I’ve been interested in since I first learned about its exsistance when I watched the documentary Gasland by Josh Fox, in my Sociological Foundations class at Point Park University. I was a sophomore at that time, and this was also the year I discovered how great it felt to be passionate about something. That something being photography. This was in the Fall of 2012. Then in the Fall of 2013 I started photographing fracking sites and tried to get as close to them as possible. Most sites I found were non-active and what was left behind was just the drill pad. I started photographing in places near my hometown of Columbiana, OH. Places such as Lisbon, OH and Rogers, OH where fracking sites are still very present. But this scar that hydraulic fracturing leaves on the land is what really sparked my interest in learning how this process affects our country. This was the beginning. I’m interested in exploring not only the relationship the land has with fracking, but the other elemental relationships within this natural gas extraction process. I want to learn from the voices of those this has directly and indirectly effected, because I believe with that we may learn some truth to this county-dividing subject.